Here are my IDP Defensive Lineman Rankings for Dynasty Leagues. Obviously, age becomes a more significant factor in dynasty leagues compared to redraft leagues and consequently I have provided the ages of all the players listed (as of 9/1/2010). I will continually update these rankings throughout the off-season to reflect changes in free agency, defensive schemes, defensive playing time, rookie draft selections, etc. I would love to get feedback from my readers. Often times, we get stuck in our own philosophies and tendencies. So it's nice to get a different perspective on things. Your comments will definitely influence my rankings. Defensive linemen are by far the most inconsistent fantasy point producers during the year. Many linemen will go three or four weeks without registering a sack and then, exactly when you drop or bench them, they have a multiple sack game. This can be extremely frustrating for fantasy owners. In addition, there aren't many unknown linemen that emerge during the season and consequently the waiver wire is usually not packed with worthwhile fantasy defensive linemen. With this being said, in order to lessen my "cognitive dissonance", I try to use many of my early round defensive draft picks on defensive linemen (unless the scoring system doesn't reward much for sacks). Obtaining guys like Jared Allen and Justin Tuck allows me to plug them in my roster and not worry about their ups and downs throughout the season, since they have proven their consistency throughout their careers. Also, when you're trying to fill that last defensive lineman position, I prefer to go with younger, high risk/high reward players such as Everette Brown or Connor Barwin as opposed to the safer, veteran players such as Richard Seymour or Albert Haynesworth. This philosophy is reflected in my lower-tier rankings. Age: 28 1. RDE Jared Allen (MIN) - This is an obvious one. Allen was the top fantasy lineman by a substantial margin in 2009. Not only does he get to the quarterback on a consistent basis, he seems to come up with a handful of big plays every year. Allen provides the largest relative fantasy value of any defensive lineman and should therefore be one of the first defensive players selected. Age: 25 2. RDE Mario Williams (HOU) - Williams had somewhat of an off-year in 2009 by compiling only nine sacks. However, over his last three seasons in the league, he has averaged 12 sacks per year. The possible emergence of Connor Barwin at LDE could take some pressure off of Williams and allow him to return to his double digit sack production of 2007 and 2008. Age: 27 3. RDE Trent Cole (PHI) - Cole has been a model of consistency over the last four seasons. During that span, he has averaged over 10 sacks per season and over 60 total tackles. Defensive linemen are the most inconsistent fantasy producers. With this being said, Cole becomes a valuable commodity in the IDP world. For a more in-depth look at Justin Tuck, click here. Age: 30 5. RDE Julius Peppers (CHI) - Peppers answered all the doubters this season by registering 10.5 sacks to follow up his 14.5 sack season of a year ago. This marks the fifth time in eight seasons that Peppers has registered double digit sacks. His move to Chicago really doesn't affect his fantasy value at all. I expect him to continue to put up double digit sack numbers. He doesn't have a ton of help on the defensive line, but he didn't in Carolina either. Age: 29 7. LDE Robert Mathis (IND) - Mathis' 2009 numbers are a bit deceiving. Yes, he did have only 9.5 sacks. However, all 9.5 of those sacks were registered during the first 12 games of the season. Mathis only registered one tackle and no sacks during the last five games of the season due to injury issues. If he had played a full injury-free season, he probably would have had 13-15 sacks. As long as Freeney continues to draw the attention of defenses, Mathis will be a top 10 fantasy DL. Age: 29 9. RDE Will Smith (NO) - Smith was sure "getting jiggy wit' it" in 2009 by sacking the quarterback 13.5 times. Personally, I think the "Fresh Prince" played a little over his head in 2009 and may be somewhat overvalued heading into the 2010 draft. However, he does have the advantage of playing on the Saints defense where he has plenty of sack opportunities since opposing teams are usually trailing the Saints and have to throw to catch up. The addition of Alex Brown on the left side should help solidify the Saints line and decrease the amount of double teams Smith will be seeing next season. Age: 31 10. RDE Aaron Kampman (JAX) - From 2006-2008, Kampman was a top 8 fantasy defensive lineman. During this span he averaged 71 total tackles and 11.5 sacks per year and established himself as one of the most productive fantasy defensive linemen in the NFL. Kampman's numbers took a severe hit in 2009 however when he was moved into a rush linebacker position. After signing with the Jaguars in the off-season, Kampman will return to his natural defensive end position. He should be a great fit in Jacksonville and I can see Kampman putting up top 10 numbers next season. Age: 29 11. RDE Darnell Dockett (ARI) - Dockett's numbers have never been overly impressive. However, he did finish as the number 10 lineman in my scoring system by having both solid tackle (54 total tackles) and sack (7.5 sacks) numbers. The addition of Dan Williams at nose tackle should help Dockett penetrate the line on a fairly consistent basis. I look for Dockett to replicate his 2009 numbers next year. Age: 30 15. RDE Justin Smith (SF) - Words cannot describe how atrocious Smith was last season. Through 15 games of the season, he only had 2.5 sacks. He finished the year with six sacks because he registered 3.5 sacks against the lowly Rams in the final game of the season. With all this being said, Smith still finished as the 12th highest scoring lineman due to his above average tackle numbers. The fact remains that Smith is one of the better tackling linemen and is therefore a fairly safe pick to be a top 20 defensive lineman. Age: 32 19. RDE Kyle Vanden Bosch (DET) - If you read my articles, you probably know that I don't have much love for KVB. I think he is highly overrated as a standalone defensive lineman. However, I think KVB can be a very good player when surrounded with a strong supporting cast and this is exactly what he has in Detroit now that the Lions have drafted Suh and signed DT Corey Williams (and they have Cliff Avril on the left side as well). I think KVB can have a top 15 season. However, he is 32 and only has a couple years left which hurts his dynasty value. Age: 24 20. LDE Calais Campbell (ARI) - Campbell took advantage of teams focusing on Pro-Bowl RDE Darnell Dockett by getting to the quarterback 6.5 times. Campbell is only going into his 3rd season and is a talented player who should only improve with time. The addition of NT Dan Williams in the draft should further increase Campbell's chances for success. I look for him to improve upon his 2009 numbers. For a more in-depth look at Alex Brown, click here. Age: 29 26. NT Jay Ratliff (DAL) - Ratliff is one of the few nose tackles in the league who is actually a viable fantasy option. Ratliff has finished in the top 25 for defensive linemen in each of the past two years. Although is upside is quite limited, he has established himself as one of the safer defensive tackle picks. If you are look for consistency, Ratliff is your man. Age: 26 30. RDE Haloti Ngata (BALT) - Ngata had a down year last season mainly due to lingering injury issues. He returns in 2010 fully healthy and I expect him to regain his fantasy form. He surprisingly finished 27 overall in points scored for defensive linemen in 2008 and is surely capable of putting up those type of numbers again. In tackle-heavy leagues, he's a nice option. Age: 23 33 (45). LDE Michael Johnson (CIN) - I'm not a huge believer in either Antwan Odom or Robert Geathers and I think Michael Johnson will have plenty of opportunities to unseat one of these guys for a starting job. Johnson is kind of a wildcard in that we haven't seen much from him yet and I'm a little weary of this pick since the defensive line position in Cincinnati always seems to be up in the air. The Bengals have been experimenting with Johnson at strong side linebacker though and he could be the sneaky LB at DL play this season (ala Trevor Scott of last year). Johnson is a high risk/reward pick and could be a nice selection in the right situation. Age: 24 34. RDE Kroy Biermann (ATL) - Biermann is a great name and he had a solid season. In fact, he finished 19th overall in my scoring system for defensive lineman. He played a decent amount of snaps even playing behind John Abraham and I see no reason for a reduction in playing time for "Beer Man." He's had a great preseason with sacks in each of his first two games. Age: 33 35. LDE Shaun Ellis (NYJ) - Ellis had a nice year and seemed to thrive under new, defensive-minded, head coach Rex Ryan. I'm always a little bit skeptical of 3-4 DEs such as Ellis. However, Ellis has proven throughout his career that he is a top 30 defensive lineman. Keep in mind though that Ellis is 33 years old and he doesn't have many years left. Age: 30 37. RDT Kevin Williams (MIN) - Williams' sack totals weren't off-base with his previous year's accumulation. However, he had a career-low in tackles. I attribute these low tackle numbers to Williams being unhealthy for a large part of the 2nd half of the season. Tackle-wise, I think Williams will substantially improve next season and I foresee a similar sack total. Age: 23 38. LDE Charles Johnson (CAR) - Johnson has had 10 sacks in the last two seasons as a backup and, now, with Julius Peppers gone, it looks as though he may become the starter at right defensive end. He doesn't do much for you at all in the tackle department, but I wouldn't put it past Johnson to register 6-8 sacks. 39. NT Kelly Gregg (BALT) - Kelly Gregg, similar to Jay Ratliff, is one of the few nose tackles that are worthy of a fantasy roster spot. Gregg is a tackling machine and can provide consistency to fantasy owners which is something hard to find with defensive lineman. Gregg is usually good for 65-80 total tackles. However, Gregg is 33 years old and the Ravens used a high draft pick to draft NT Terrence "Mount" Cody and Gregg will more than likely lose some playing time next year. He's a decent option in 2010, but may lose most of his fantasy relevance after the 2010 season. Age: 23 40 (43). RDE Matt Shaughnessy (OAK) - "Shag Nasty" had a good 2nd half of the 2009 season. In that time period, he registered 4 sacks in eight games and throw in decent tackle numbers. With the addition of Richard Seymour on the left side and another year under his belt, Shag Nasty enters 2010 as a potential sleeper candidate. I'm not as high on him as others are just because he plays in Oakland and they haven't had a viable fantasy lineman there for a while and I have a sneaky suspicion that Oakland is going to give some 3-4 looks this season. He's worth a shot in later rounds if you need to fill spots. August 23 Update: Even though it looks like Shaughnessy is only going to be a two-down player to start the season, he had two sacks in his preseason game against the Cowboys and could end up being the Raiders best defensive lineman. Age: 25 41. RDE Darryl Tapp (PHI) - IDP owners have been waiting for Tapp to blossom into a top 15 defensive lineman for the last couple of years and it just hasn't happened. Tapp had an off-year last year by only registering 2.5 sacks. Tapp will probably start the season as the starting LDE in Philadelphia. However, I expect rookie Brandon Graham so steal away a decent amount of snaps from him. I'm hoping that a change of scenery will improve Tapp's performance and production. He's only 25 so he still has a chance to become a decent fantasy option. Age: 28 43. LDT Jonathan Babineaux (ATL) - Both Jonathan Babineaux and Kroy Biermann emerged this season for the Falcons. It's difficult to tell which player (if any) is the real deal and which one is the fluke. Even though he is a defensive tackle, I would bet on Babineaux being the slightly better play in 2010. He was a standout at Iowa and was fairly highly touted in the draft. He was quite consistent throughout the 2009 season and registered a nice sack total of six from his interior position and finished with the 19th most points for a defensive lineman in my scoring system. I don't think he'll have quite as good of a year next season, but he's still should be a solid low DL3/high DL4. Age: 30 45 (41). LDE Richard Seymour (OAK) - Seymour has always been a bit overrated in fantasy-terms. However, with him now in Oakland, he should see an uptake in his tackle numbers since the Raiders defense is constantly on the field. He's usually got for 4 or 5 sacks as well. August 23 Update: Seymour has been moved to RDT and becomes a great play in DT-require leagues in which he is still classified as a defensive end. Age: 29 47. RDT Tony Brown (TEN) - Mr. Brown has increased in sack total each year since he entered the league in 2004. Last season he had 5 sacks and with the departure of Kyle Vanden Bosch, Brown may be able to increase those numbers. He puts up fairly mediocre tackle numbers though, especially for a defensive tackle. Brown is a decent DL4 option. Looking for help with your 2010 Fantasy Football draft(s)? 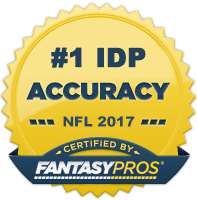 Please support The IDP Guru and purchase a $5 2010 Fantasy Football IDP Draft Guide. It's over 19,000 words and 42 pages long! To purchase or for additional details, click here. I also have an iPhone/iPad app available that puts all of my rankings right at your fingertips for your draft. It's only $4.99 and can be purchased here.